Please use the email button below to submit a testimonial. ​You can also email me your comments, updates & pictures of your rat babies! I recently picked up my ratties from Atlantis Rattery and could not be happier with them. All of them are super sweet and well socialized! Her rats are absolutely beautiful and I can tell that they were raised with lots of love and care. Ashley is an amazing breeder and I definitely recommend her to anyone searching for beautiful, happy, healthy rats. She kept me updated on the babies and also posts a lot of photos to her page. I have nothing but good things to say about Ashley at Atlantis Rattery, very professional, patient, and truly cares about the well being of her animals. I know I'll be back for more! I have 2 amazing animals from Atlantis. She was very helpful from the beginning, Arranged to ship them all the way to me in Holland for me. They are drop dead gorgeous, very sweet of character and gave me many beautiful sweet baby's already. she also is very helpful with giving breeding experiences and suggestions. she has bought a few rats from me to, and is being a very good new mommy for them. Ashley of Atlantis Rattery is an awesome breeder and an amazing friend. She's always polite and quick to help anyone that needs it. She sent me several of her rats and I ADORE them. Their temperament is amazing and they are extremely healthy. 5 STARS! I have gotten 4 baby boys from Atlantis Rattery and they are all sweet and friendly and we'll socialized. They love to play and lick your hands when you are near them They had a bit of a myco flare up when I first brought them home because they were a bit stressed but I contacted Ashley and she took care of it right away and now they're better and happier than ever! She's always very helpful and answers promptly! All the rats I saw there were just as healthy and happy and rambunctious as my 4 boys, she takes amazing care of them! Atlantis Rattery is a wonderful pet breeder, possibly the best in my opinon. I knew minimal to nothing about rats before I got them. She not only educated me properly on the best care for them but continues to keep in contact with adopters to ensure the best of the rats from pregnancy birth to homes and there after. Atlantis rats are raised in a spacious and clean environment. They are fed well, cared for and when they coke home to you, you can see the quality! The fur is immaculate in colour and texture. Their personalities are to die for. 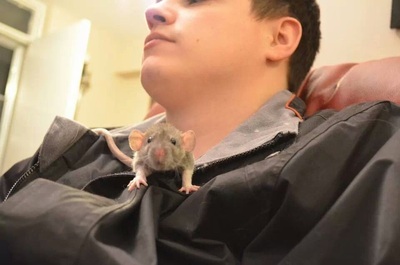 The kisses, the love of the owners and want for attention you feel so loved by Atlantis rats. They greet you at the cage, they are very healthy and we'll raised. Throughout my ownership I run to her with any questions I may have and she is prompt in answering. She is educated, educated on rats aswell and will admit to anything she is not certain on which is the biggest comfort as an owner to know your not being lied too. I hope everyone sees Atlantis Rattery and her beautiful, healthy and friendly rats! Wundervolle Tiere! Super toller Kontakt auch nach dem Kauf! Abwicklung von Kanada nach Deutschland war zwar kompliziert aber sie war absolut Hilfsbereit und immer da! Translated from German: Wonderful animals! Super great contact even after the purchase! Settlement of Canada to Germany was indeed complicated but it was absolutely helpful and always there ! Geile Hammer tolle gesunde Tiere.. I purchased two rats from Atlantis Rattery, a male and female blue Russian burmese. Atlantis Rattery answered all the questions I had in regards to these rats before purchase and has continued to do so after purchase. The rats are in excellent health and are very sweet loving little creatures. I would recommend Atlantis Rattery to anyone I know and I hope to do more business with them in the future. We have 3 happy, healthy rats from Atlantis Rattery. Any questions we have had have been quickly and professionally answered and our rats are wonderful. I would recommend Atlantis Rattery to anyone. I got my 5 rats from Ashley at Atlantis Rattery about a year ago, and I couldn't have been more satisfied. Ashley helped us find the right rats for us, and even at the last minute when we went to pick up our reserved babies, she suggested we switch one of them to a different rat to meet our personality request and we ended up with an amazingly sweet rat - the best one ever! All the rats we got are wonderful. The rats are friendly and affectionate and all have unique personalities. The 5 rats get along perfectly in their cage and have all been very healthy. 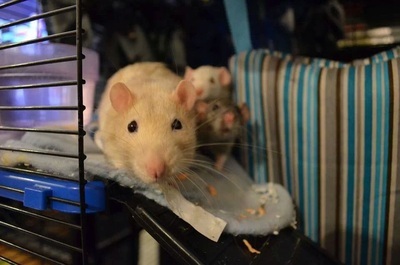 People who see us with the rats say they can tell the rats are very attached to us and they are amazed that rats can bond so strongly with their owners. When we are in search of new baby rats, we will go nowhere else but to Ashley at Atlantis Rattery. I feel very fortunate to only be a 30 minute drive from her door. Some people travel a full day to get her rats and I would say that it would be well worth the trip! 5 Stars for Atlantis nothing but fabulous ratties from here. Wouldn't buy from anyone else!!! Top notch! Ashley from Atlantis Rattery is amazing! I went to her looking for dumbos and have been obsessed with her rats ever since! I have adopted 6 rats from her 5 babies and a 6month old girl. All 6 rats are amazing. They are well socialized even as babies and the older one is just the most amazing thing ever. She is very knowledgeable about rat illness and health care and makes sure her babies are healthy before selling. Ashley also offers the most beautiful varieties of rats that I have come across in southern Ontario. I have to refrain from visiting her website otherwise I want more and more rats! 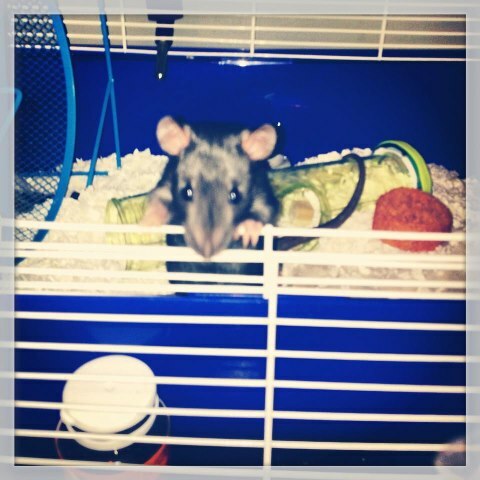 I will definitely continue to buy pet rats from her in the future! Just recently I purchased 3 amazing rats from Atlantis Rattery. These little boys have been a great addition to our family. They are very social and LOVE attention. Ashley was very helpful with everything that came along with purchasing these boys. I will always have rats as pets and I will only buy from Atlantis Rattery. 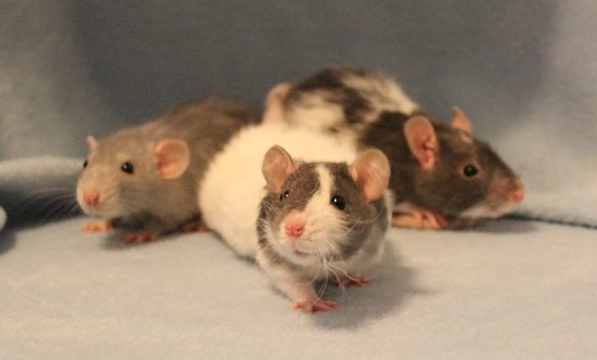 I have 3 Atlantis Rattery babies, and I wouldn't give them up for anything! They are so affectionate and loving. Always full of kisses, and the first of my 12 ratlets to come running to the cage door when I come into the room. They are happy, healthy ratties, and have been since the days I brought them home! I'm about an hour away from her, and she's very patient with me asking for pics constantly of my reserved babies, since I can't go see them in person! When I lost my heartrat, and asked her if she had a female in his colouring since I only had females after him, she did and I was able to pick her up that weekend! She's an awesome breeder and very informative! Even tho I've had rats for years, I still learn something new from her all the time! I absolutely recommend her rats to anyone, new rat owners and those who've loved ratties forever! Atlantis Rattery has been so helpful over the last month. I am a first time rat owner and I could not imagine having such a positive experience with anyone else. I found Atlantis Rattery after researching the internet about owning pet rats and reading several suggestions to buy your rat(s) from a breeder (instead of purchasing from a pet store). I couldn’t agree more. 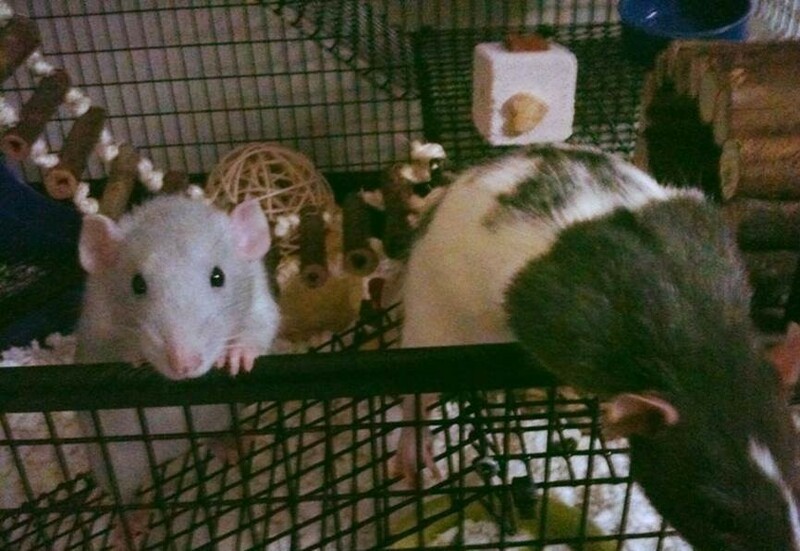 Even before I purchased my 3 male rats (Mick, Keith and Charlie), we were in frequent communication as I still had many questions before making the final leap. they helped find the appropriate cage, and the Atlantis Rattery website helped with deciding what I would use as bedding, litter, food and supplements to keep my rats happy and healthy. Atlantis Rattery is also my main supplier of food, sprout seed, supplements and bedding. 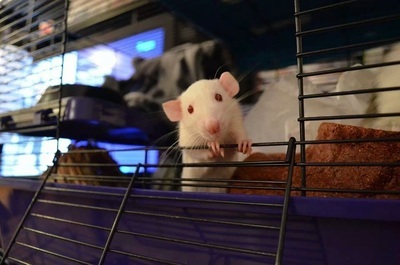 I felt this was the best and most convenient option as Atlantis Rattery has experimented with several products through her experience and has found the best of the best to keep her rats healthy; why not continue the tradition! Mick, Keith and Charlie are happy, playful and loving! They beg to come out of the cage and are happiest when sitting on my shoulder or lap. Whether you are looking for information about owning rats or are ready to purchase, Atlantis Rattery is by far the best choice as you will be guaranteed a wide range of colours and coat types, wonderful temperament, all necessary information and tools needed to have the best experience with your newest family member(s). 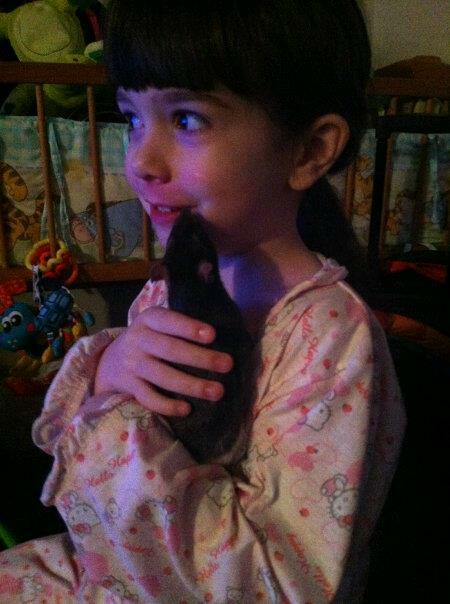 Before I adopted my ratbabs from Atlantis Rattery, I had not only never had a rat, I had never even had a pet! I was really nervous and Atlantis made the whole process really easy and made me feel way less nervous about the whole thing. The two boys (Charles the blue Berkshire and Erik the black variegated) once I’d brought them home turned out to be incredibly friendly and very well-handled: a little shy to begin with because I was new but happy enough to be picked up after a few days. They both love to run into my lap and onto my shoulders during free range and give out lots of ratty kisses. Erik is adventurous and clever and a bit of an escape artist, but he always returns back to me and loves to groom everyone: Charles, me, my roommate, the vet. Charles is a little shyer but also calmer, and will often sit quietly in your hands or inside your shirt and just brux away as you pet him. He loves food, and is always the first to try a new vegetable. They’re boys, so they play fight, but they never hurt each other, and spend most of their time grooming each other anyway. Atlantis Rattery really was the perfect place for a first-timer to find her rats and I couldn’t be happier. I came to Atlantis Rattery looking for some baby boys after losing my oldest rat last month. I took home 2 boys and they have been just amazing. My 2 older rats took to them immediately and all four are now inseparable! The babies were brave and very well socialized from the start, and they are even friends with the cats now too. and I would highly recommend Atlantis Rattery to all. Atlantis Rattery is amazing. I am pretty new to the rat world and they make the transition easy! The rats are well socialized, healthy, bright and alert! I got 2 rats and then 4 weeks later went back for 4 more! The bonds I have made with these little guys is unbelieable! They are such clowns and also loving. It's dangerous for me to visit the rattery and I not only seem to walk away with rats, foods, and other items they have for sale, but Atlantis Rattery is so easy to talk with that before you know it, you have been there twice or three times longer than you had anticipated! I will definintely continue to get future rats from Atlantis and recommend this rattery to anyone and everyone! 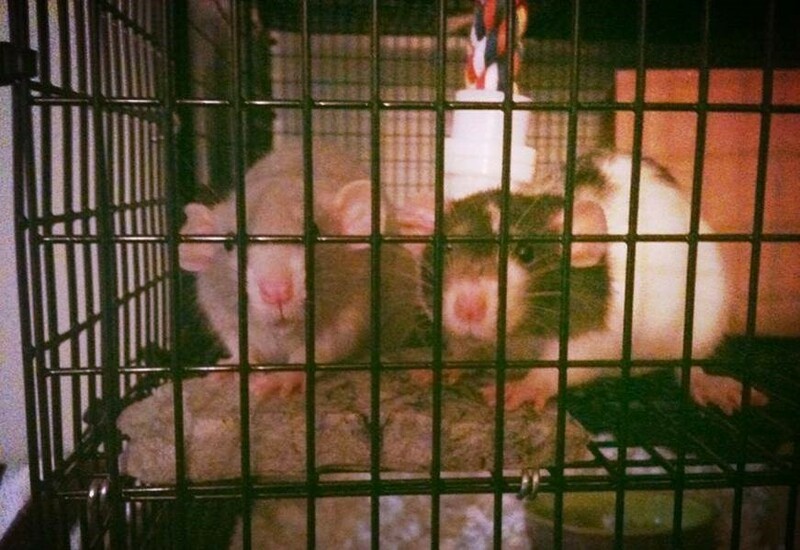 I bought two dumbo rats from you guys in september 2013, and it's one of the greatest things ive done. They are currently running around my bedroom exploring. I just wanted to thank you for doing a great job. They dont pee or poop outside their cage and they are super people friendly. Widdle and Puke are a loved part of my family. 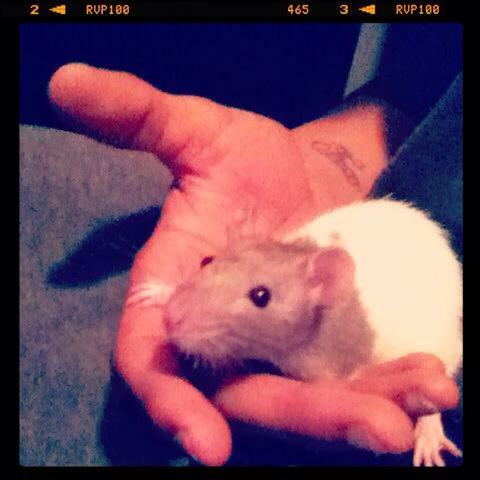 Got two rats for me and my brother , this little guys mine , couldn't be happier their such an amazing pet :)! Thank you very much ! lot when she's out (I never knew rats made sounds) and she's very curious. Emile (the dumbo) is a little more cautious and quiet. Both are great pets though. I tried to take some pictures tonight to show you, but Emile HATES the camera (the flash scares her) and Remy doesn't sit still, lol. I'll keep trying, and send you a picture once I have some luck getting one! The babies I got from you in the summer are doing great - they mercilessly chase the cats, and climb like crazy - I wonder if you spliced monkey genes in them, I have never seen rats climbs so much.